Of proud racing lineage, Xfinity's Ty Dillon has a golden opportunity as the fill-in for the injured Tony Stewart on the Sprint Cup circuit. There are only so many cars to go around on the NASCAR circuit, and hitchin’ a ride ain’t easy. Scoring a Sprint Cup seat is damn near impossible. The drivers will not be moved. The great ones hang on until they can’t. The rest chug along until the money dries out. Unless a franchise expands (in this economy? ), an ace is straight up pink-slipped (and another top gun isn’t lying in wait), or, God forbid, a driver dies in the saddle, a fresh-faced up-and-comer doesn’t stand much chance of getting called up to the Bigs. And yet Ty Dillon caught a break. This Sunday, Dillon, a cherubic 24-year-old who could pass for a player on the Bad News Bears, will take his place on the starting grid at Phoenix International Raceway for the Good Sam 500, which airs on FOX at 3:30 p.m. Eastern. “I’m just fortunate,” he says. How did he get so lucky? Well, that’s a funny story. In late January, just before the beginning of Speedweeks, Tony Stewart was trundling around in some Southern California dunes with friends—Don Prudhomme (the drag racing legend), Jeff Gordon (the freshly retired four-time Cup champ) and Ray Evernham (Gordon’s prime-era crew chief) to namedrop a few—when he touched down hard in a hollow and suffered an impact that broke his back. At least that’s the official story. Stewart’s injury upsets a season that the 44-year-old driver-owner had pronounced as his last, and as yet there is no definitive timetable for his return. (He was just cleared by doctors to start rehab, according to an announcement his team made on Wednesday.) Mostly, there’s just smoke—which, incidentally, is Stewart’s nickname. The smart money is on the weekend of May 20, the occasion for NASCAR’s All-Star race—which limits its field to past Cup champions, relatively recent checkered flag holders, and past All-Star winners. (Think of the sponsors that must already be on the hook …) Stewart, a three-time series champion and top finisher in the 2009 All-Star sprint, more than meets these qualifications. Smoke’s bench? Well, it’s not all wet. Right now, Dillon is one of two subs in the active Stewart-Haas rotation. The other is 32-year-old Brian Vickers. (You know, that guy playing golf with Arnold Palmer, Chris Bosh and Kevin Nealon in those ubiquitous TV ads for prescription heart thinners?) Vickers is a seasoned stock car pilot who might well still have a full-time ride if his career weren’t under constant threat from blood clots. After an 11-month hiatus from racing that was precipitated by open heart surgery (which, hopefully, solved the clotting problem and slaked a need for blood thinners—a competition no-no), Vickers climbed into Stewart’s No. 14 Chevy at Daytona and brought her home in 26th, a finish that looks far worse than his actual run. The following week in Atlanta, Dillon took the wheel. Where Vickers has been-there, wrecked-that, Dillon kinda just got rolling. While technically his four years’ experience as a national touring pro has been mostly limited to the truck and Xfinity series (his combined scorecard totals so far: 40 top fives and two wins), Dillon has been in this game for far longer. His grandfather is the legendary franchise owner Richard Childress. His father, Mike, drove for Childress and now runs his three-car Cup team, Richard Childress Racing. The rising star in that trio? Dillon’s 25-year-old brother Austin. Not only does he rock the Intimidator’s old No. 3, he has it hung on the tenth spot on the leaderboard heading into Sunday’s race. Doubtless many will be tempted to cry nepotism here, but who would hear of it in a sport that was founded on and flourishes in this concept? “It’s nice to have [family] in the same sport to bounce ideas off of and talk about things,” Ty says. 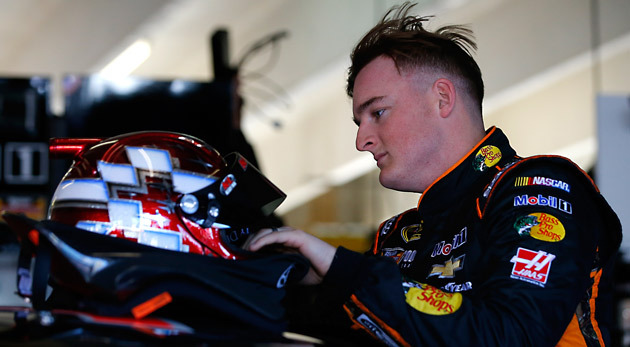 Prior to this season Ty Dillon had a mere eight Cup starts to his name. A ninth came last month at Daytona. His ride for that run, an outfit called Circle Sport-Leavine Family Racing, isn’t a subscriber to NASCAR’s charter system—essentially, a Cup super division dominated by the sport’s richest teams with guaranteed grid parking for all members. This meant Dillon actually had to qualify for the race. He surprised—starting 12th, finishing 25th. A few days later Stewart Haas announced they had snatched Dillon up. It’s a dream job, yes, but more like a second job for the legacy kid. Dillon is still obligated to RCR, the family’s race shop—which furnishes his Xfinity ride. That’s a lot of pressure, having to serve two masters and whatnot. But in Atlanta, to Dillon’s great relief, the experiment went smoothly. “When you’re swapping between different cars and organizations over the weekend,” he explains, “you kinda get nervous because there’s different ways that different teams go about things. But it really went flawless. My crew chief for the No. 14 [Michael Bugarewicz] and my Xfinity crew chief Nick Harrison, we all had great chemistry." On Dillon’s Cup radio, there was another understanding voice: Smoke’s. “That was definitely huge,” Dillon says. His weekend was pretty big, too. In the Xfinity race he placed fifth. In the Cup race he took 17th. Of course this weekend in Phoenix will be all about pushing the pace; the hope is that, sooner rather than later, all this momentum builds up to a full-time ride. No, NASCAR doesn’t produce sub-to-starter arcs with the frequency of, say, the NFL. But there are a few moving examples around the track—like, say, Brad Keselowski and Kevin Harvick to name two ringers turned, well, title ringers—that should brim Dillon with gallons of hope. Not that he needs it. Granted there’s a slim chance of Dillon’s Stewart-Haas temp job becoming permanent. (For now, it’s a weekend-only gig; long term, the seat’s been promised to Clint Bowyer, a Cup veteran who is currently on loan to HScott Motorsports.) But if a full-time Cup career is the goal, and Dillon says it is, he’s making good time. Who knows? The next time he finds himself in the throes of a critical substitution, he might well find himself wondering who’ll be keeping a seat warm for him.